The husky, cast iron 308 Base Mount weighs 5lbs. (2.3kgs), making it compact and stable. 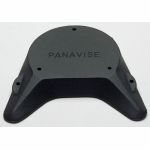 Included are four non-marring, anti-skid neoprene base pads. Two 1/4 - 20 holes are drilled and tapped on the side extension for conveniently mounting accessories such as the model 371 Solder Station. Three 1/4 -20 screws and nuts for mounting Bases are included.